The pediatric population with refractive error needs regular assessment and prescription adjustment. Detection of refractive error and accurate prescription of glasses to prevent amblyopia in children is possible only if the general ophthalmologist is aware of the basic steps of assessment and prescription. This paper discusses the considerations for prescribing a refractive correction in infants and children, with reference to the current literature. Refraction and spectacle prescription in pediatric population could be challenging, considering the inability to obtain a reliable visual acuity, subjective refraction, variable control of accommodation, and risk of amblyopia. The pediatric population with refractive error needs regular assessment due to growth in the anteroposterior length of the eye till 7–8 years of age. In these situations, where subjective refraction is not possible, objective refraction using retinoscopy is the gold standard for determining refractive status in preverbal children. Cycloplegic refraction should be carried out in all children, with or without strabismus, in order to prevent underestimation of the refractive error and also for a better visualization of retinoscopic reflex. Before retinoscopy, visual acuity should be assessed in both eyes individually using age-appropriate charts, along with an assessment of extraocular movements, cover test to rule out strabismus, convergence, and anterior segment examination. Dry retinoscopy could be performed before wet refraction in cooperative children to assess the accommodative ability. A regimen commonly used in clinical practice, which has a comparable cycloplegia to atropine 1%, includes a combination of cyclopentolate 1% eye drop (instilled twice), followed by tropicamide (0.8%) with phenylephrine (5%), at 5-min interval. Retinoscopy has to be performed 45 min after the installation of the first drop. In infants (<1 year), the cyclopentolate (1%) should be diluted to 0.5%, to avoid side effects. Atropine eye ointment (1%), which is the strongest cycloplegic agent, preferred in children <3 years of age, has to be applied twice a day, 3 days before refraction. It is available as 0.5% or 1% eye drop or eye ointment. Side effects of cycloplegics have been elaborated below [Table 1]. Factors such as visual needs according to age, strong accommodative elements, risk of amblyopia, age-related emmetropization, and associated conditions such as strabismus should be taken into account before prescribing glasses for children. Neonates are normally hypermetropic (<4D), with minimal astigmatism (<2D). With increasing age, hypermetropia and astigmatism reduce and emmetropization is completed by 7–8 years. Taking into account the visual needs of a child, hypermetropia is corrected earlier than myopia. In children, small amounts of hypermetropia can be easily overcome with strong accommodation. Hypermetropia of more than 5D is difficult to overcome and can result in asthenopia. Furthermore, uncorrected hypermetropia has risk of developing refractive accommodative esotropia and amblyopia. In the absence of esotropia, a mild undercorrection can be prescribed in both eyes equally to allow for some amount of accommodation. According to the American Association for Pediatric Ophthalmology and Strabismus guidelines, in infants, hyperopia of <6D does not require correction. In children having esotropia with high AC/A ratio, along with full cycloplegic distance correction, bifocals have to be prescribed to correct the additional near deviation. Myopia of ≤4D does not require correction in infants and toddlers as their visual needs are less. At the age of 3–4 years, when children begin to have significant hours of distant viewing, prescription of glasses for lower degrees of myopia can be considered. Care must be taken to avoid overcorrection. Aim should be to prescribe lowest minus power needed for best-corrected visual acuity. In the presence of intermittent exotropia, even the smallest myopic correction has to be prescribed in order to induce convergence and overcome exotropia. As astigmatism cannot be overcome by accommodation, even an error of >1.5D has to be corrected in children above 2 years in order to prevent amblyopia. In young children, the aim should prescribe full cylindrical correction to prevent any chance of amblyopia. Smaller cylinders can be prescribed for older children even if visual acuity is mildly reduced or if they have small cylindrical power in addition to spherical power. 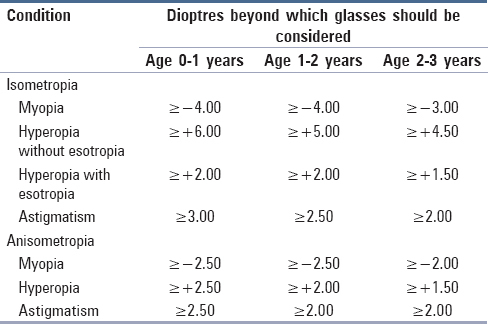 Guidelines for the prescription of glasses in the pediatric age group, proposed by the American Association for Pediatric Ophthalmology and Strabismus, has been elaborated below [Table 2]. Hypermetropic anisometropia and cylinder anisometropia are more amblyogenic than myopic amblyopia. Hence, a difference of >1.5D hyperopia or astigmatism should be corrected early. In situ ations where amblyopia is already present, occlusion therapy is mandatory. In aphakics and pseudophakics, during the first few months, overcorrection by 2.00–3.00 D is recommended because the child is more into near activity. Later by 1 year, the near vision add can be reduced by 1.00 D to 1.50 D.
From 2 to 3 years onward, distance correction with bifocals should be considered when the child can adapt to these. They will require bifocal/progressive addition lens correction for life. In younger children, the above rules serve as important guidelines to prescribe glasses. Detection and accurate prescription of glasses in children are possible only if the general ophthalmologist is aware of these basic steps of assessment and prescription, thereby decreasing the risk of developing amblyopia. Sani RY, Hassan S, Habib SG, Ifeanyichukwu EP. Cycloplegic effect of atropine compared with cyclopentolate-tropicamide combination in children with hypermetropia. Niger Med J 2016;57:173-7. Ciner EB. Management of refractive error in infants, toddlers and preschool children. Probl Optom 1990;2:394-419. Mutti DO, Mitchell GL, Jones LA, Friedman NE, Frane SL, Lin WK, et al. Accommodation, acuity, and their relationship to emmetropization in infants. Optom Vis Sci 2009;86:666-76. Sainani A. Prescription of glasses in children. J Clin Ophthalmol Res 2013;1:169-173. Miller JM, Harvey EM. Spectacle prescribing recommendations of AAPOS members. J Pediatr Ophthalmol Strabismus 1998;35:51-2. Pediatric Spectacle Prescription and Retinoscopy Made Simple; 2019. Available from: http://www. Eyerounds.org. [Last accessed on 2019 Jan 23]. Leat SJ, Shute RH, Westall CA. Assessing Children's Vision: A Handbook. Oxford: Butterworth-Heinemann; 1999.